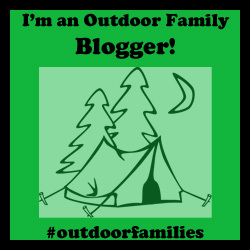 We're an outdoor family. I'm an outdoor dad. My sons are outdoor kids. We hike, bike, snowshoe, ski and more in the Canadian Rocky Mountains. It's the wildest backyard on earth, and we'd like to share it with you, your kids and your family. Mack belaying his old man. One of the dilemmas facing parents who want their teenagers to get off their butts and go hiking, is the lack of groups for teens that go hiking. Want them to go snowshoeing, rock climbing or ice climbing? Good luck. When I was a teenager, I was lucky enough to belong to a Scouting group that was more interested in getting out to the Rocky Mountains than in earning badges, and that had Ventures and Rovers so we had a social group to go hiking, scrambling and even mountaineering with. But Scouts had already lost its cool back then. Today, the concept of a youth organization with uniforms and salutes and badges is, to put it mildly, not relevant to most teens. Just saying. I'm fortunate that my sons, now 16 and 11, still want to spend time with their dad. Or at least they pretend to, which is good enough for me. Not only that, they genuinely enjoy going to the mountains with their old man. But what about other teens, and pre-teens for that matter, who don't have outdoorsy parents to take them out? Unless they have friends with the inclination to get out and a driver's license to get them to the trail, they're hooped. When I saw the University of Calgary's Outdoor Centre offering Youth Ice Climbing lessons, and that parents could take it too, I jumped at it. First, I asked Mack, if he'd like to go ice climbing. Affirmative. Then I asked if he'd mind if I tagged along. He said he'd prefer it. To say I was excited would be an understatement. I'd get to share the brotherhood of the rope with my son, and maybe meet some other like minded parents. I was a little surprised when we showed up and the other six participants were all teens. I was the only parent. But Mack didn't seem to care, the other teens didn't seem to care, so neither did I. And all six teens were keen to be there. There was no complaining about the cold. No complaining about having to carry the ropes to ice falls at King's Creek in Kananaskis. No complaining at all. They encouraged each other. They were excited by the beauty of the surroundings and the challenge of the ice. A few of the teens were clearly interested in more than a one day ice climbing course could offer. They wanted to go again...but how? They didn't have many options other than paid ones. It's either talk their parents into shelling out a hundred bucks or more for a guided day in the mountains, or not go. Luckily, these kids had parents who were willing and financially able to send them. In fact, one kid's parents had shelled out for so many outdoor programs at the U of C that all of the guides knew him. For all the talk and hype about the need to get youth, from tots to teens, out into nature, there hasn't been much action to make it happen. Thankfully there are a handful of organizations like the University of Calgary that are starting to run outdoor programs for teens. The six on the ice climbing trip may have to wait until the U of C's summer backcountry trips for teens, but at least there's something for them. On the Nublet, Mt. Assiniboine in the background. Something amazing happens when you and your kids are dropped off by a helicopter in the backcountry with no TV, no wifi and no way to charge cell phones. The whole family is forced into the moment...adventure unfolds naturally, you have the kind of talks that only happen on the trail, and you truly get to experience and enjoy each other's presence. That's what happened when Mack, Michael and I stepped into the helicopter at the Mt. Shark helipad and stepped off it at Mt. Assiniboine. After four days with their grandmother in basic old school cabins in Fairmont Hot Springs (where we visited Lussier natural hot springs and went white water rafting on the Kootenay River...even at 80 she's a cool grandmother), I'd booked us for one night camping and one night in one of the Naiset huts at Mt. Assiniboine. I figured if it was raining, two nights stuck in a tent would be miserable for a 9-year-old and a 14-year-old, and the experience would turn them off of the backcountry instead of onto it. cabins, the nearby basic Naiset huts, and 30 or so campsites at the Lake Magog campground, there must have been a hundred or so people wandering the trails and meadows in the immediate vicinity of the mountain. For an introduction to the backcountry, this makes it a safe place for novices of all ages. You can rough it as much or as little as you want, and if the kids are resisting the wonder of it all there's the daily bribe of a Coke and cake to focus them on. After finishing off two plates of the fresh baked banana bread and chocolate cake, we returned to our campsite under increasingly cloudy skies. Mousse with Chocolate Crumble Topping." By eight we'd crawled into our tent with the pitter patter of the rain on the fly. I'd brought a deck of cards, but we didn't need them. The kids loved just sprawling out, telling jokes and relaxing to the pitter patter of the rain on the fly. I loved just enjoying the time alone with them, no electronic distractions and lots of laughing. company of a couple retired guys who'd backpacked in with one of their grown daughters. When they'd finished their breakfast, it was a young family with two daughters, 4 and 7, who'd flown in and were going to backpack out the next day. It wasn't until 11 a.m. that we'd finished our breakfast of pancakes and were on the trail for the day's adventure: an easy 500 m scramble up the Nublet, a bump on Nub Ridge on the way to the summit of Nub Peak. surefooted the boys have become on scree, how they naturally test hand holds to make sure the rock is solid...how at ease they've become in the mountains, how great it is to be an outdoor family...On top we enjoyed the views for half an hour, Mack spotted a bald eagle (not that common in the Rockies) and I was the happiest dad on earth. Our hut and its small door. An hour later we were packed up and making our way to the lodge for a cold Coke and cake. From the lodge we carried our gear the half kilometer to the Naiset huts and started cooking supper in what turned out to be a fully equipped cook hut: running water, propane stoves and lamps, gourmet quality pots and pans...not bad for the backcountry! That left us a few hours to explore before sunset and bed, and there was lots to explore. We got our feet wet hopping across and through the creek that leads down to the lake, got them wetter wading in the lake, and had fun doing nothing but having fun. When we finally went back to the hut, we found our hut mates already in their sleeping bags trying to sleep (sorry!) and more or less quietly climbed into our own bags. Even getting up at 2:30 a.m. to go to the outhouse with Michael was an amazing experience, stepping out of the hut's pitch black to a dark sky filled with millions and billions of stars filling the mountain sky. mountains are all about regardless of how old you are: taking what they give you and thriving in it all. Morning visitor at our hut. A happy dad on the flight out. A giant vault blasted into the side of a mountain, then abandoned and almost forgotten. What's not to get excited about if you're a kid (big or small)? Back in the 50s or 60s, somebody blasted a tunnel and side vaults into the side of Mt. McGillivray in Kananaskis (you can read one theory of who and why here). When I was a kid in the late 70s, getting to them was something of an ordeal. You had to bushwhack to them from the Trans-Canada highway, and if you didn't know where they were you could spend the entire day searching for the narrow entrance and never find it. But if you did know, the short hike through the brush to treeline brought you a place custom designed to trigger a kid's imagination. Click here for more kids hikes in Banff, Kananaskis, Kootenay and other areas of the Canadian Rockies. Today, you park at the Heart Creek day use area, head west and the Trans Canada Trail takes you most of the way there. Luckily, the floods of June 2013 washed out a couple big chunks of the trail, reintroducing a bit of adventure and effort to reach the vaults. After negotiating your way across the washouts, it's almost impossible to miss the well-beaten path that now leads up to the vaults in a couple gentle switchbacks. exclusivity of being able to say you went somewhere that 99.9% of even the most experienced hikers have never heard of, they haven't lost any of their ability to spark the imagination. And, as the wolf tracks we followed down the path, well beaten mountain paths are still wild. Try this hike from spring through to fall when you're looking for a fun, easy way to spend a couple hours in the mountains. Driving Directions: Trans-Canada west from Calgary to the Heart Creek day use area across from Lac des Arc. Look for the Trans-Canada Trail sign on the west side of the parking lot across from the outhouses. Click here for a driving map. 1. Being an outdoor teenager provides social status. My oldest son is in the 8th grade, and one of his friends is selling home made survival bracelets to help pay for his older brother's Scout trip to Japan. "You could tell who the hikers were," he said. "We could see all kinds of ways you could use it. Zane asked how it protects you." You're correct if you guessed that Zane doesn't hike. 2. They announce they're moving to the mountains. "When I move out, I'm moving to Banff," my 9-year-old son announced one day. "It's right in the mountains, and there are lots of trails everywhere." Later that day he also announced that when he was in high school he was going to live with me, sleep on the couch all day, and I'd have to feed him. Both of his announcements sound good to me! 3. The presents they give you are really for them...and they're for camping. That's what happened a couple birthdays ago when they gave me backpacking pots, plates, bowls and mugs. "We can take them when we go camping," one said. "Look how the mugs and stuff all fit together. It's pretty cool." Yes it is, but not as cool as the fact that he said that. And much cooler than the Skylanders his friend George gave his father. I came across an article today titled Barrier to Active Play: Safety Concerns. The thesis of the article is that one of the biggest barriers to kids playing outside is their parents' fears of kids hurting themselves, being abducted by strangers, or struck by lightening a split second before a meteor falls on them. If you're a parent, this is nothing new. Let your kids play unattended in your front yard and you run the risk of Social Services taking them away to live in the custody of the state where they'll be safe. Or worse, the neighbors will look at you with their eyes askance. Yet we all know that sheltering our kids from irrational dangers that we know exist only in our heads isn't healthy for them. It robs them of the experiences they need to learn how to identify risks, develop their sense of independence, gain the resilience to keep playing when they scrape a knee, get some exercise...In other words, it robs them of the experiences they need to become the independent, well-adjusted individuals we want them to become. This isn't something that outdoor parents leave behind in the city when we take our outdoor kids into the wilds and reintroduce them to the food chain. I've seen parents, who themselves take risks with severe consequences in the mountains, berate their child for stepping in a creek or happily hopping across boulders...Be careful! Watch your step! You're going to fall and scrape your knee! See, you fell. I told you to watch your step. Why were you watching me? Don't get me wrong, I'm not perfect when it comes to letting my boys do something I know has a greater than 50/50 chance of spilling blood. But I've learned the hard way in soooooo many areas of life that we all have to learn our own lessons. And one of the reasons I take my sons to the mountains is so they can learn their own lessons. Unless I think a bone is going to be broken or worse, I usually let things unfold as they were meant to. Just as I learned from every scraped knee, scratched shin, bruised buttock and cut finger from the Rocky Mountains to the West Coast Trail (seriously, I was 12 when I hiked that thing...what were my parents thinking? ), my sons are learning how to identify risks and decide to either take them or avoid them. Sometimes taking the risk works out, and sometimes they leave a little bit of themselves on the trail. Either way, they keep going. They don't let a little pain or a little scratch stop them. And at the end of every hike I can see the independence and confidence they've gained, and how they bring that back to their day-to-day lives in the relative safety of the city. Happy World Water Day from the Canadian Rocky Mountains: What's your favorite mountain water photo? Mommy Hiker...rediscovering the beauty of the world through the eyes of my daughter. Copyright Ken Schmaltz. Picture Window theme. Theme images by A330Pilot. Powered by Blogger.